This puzzle consists of 10 numbered beads which slide along tracks. The track has the shape of a circle with one diameter. The circle can hold 9 beads, the diameter two, and as there are only 10 beads there is a single gap. There are an odd number of beads in the outer circle, so the diameter track leads from a single bead at the top down to a pair of beads at the bottom, and it therefore splits near the bottom. 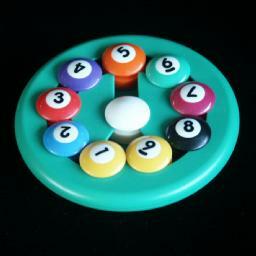 The beads are coloured like pool balls, numbered 1 to 9 in different colours, and one white ball. In the solved position, the white ball (and the gap) is in the centre, and the other balls are in order around the circle, from 1 at the bottom left to 9 at the bottom right. This puzzle was invented by Joshua Frankel, and produced by Binary Arts, now called ThinkFun. If we count only those positions with the gap in the middle, then there are 10 pieces which can be any order, giving 10! = 3,628,800 positions. All of these permutations are possible. I performed a computer search for this puzzle. The following table shows how many positions there are for each number of moves from the solved position. A move is single shift of one of the three loops (left, right, or the outer circle) in any direction. It can be solved in 15 of such moves at most (11.697 on average). In Sloane's On-Line Encyclopedia of Integer Sequences this is included as sequence A079839. Bob's 9-Ball Puzzle, a Java version of the puzzle. There are 3 loops in the puzzle; the left half, the right half, and the complete circle. Denote these by L, R, and C. A clockwise shift of all the beads in a loop is indicated by the relevant letter, and an anti-clockwise shift by the letter followed by an apostrophe, i.e. by L', R' and C'. Hold the puzzle with the middle track vertical and its split end at the bottom. Phase 1: Solve pieces 1-4. Do any moves to bring piece 1 to the left of the top position, i.e. the position where 4 will be when solved. If piece 2 does not lie in the right loop, then do L' until it lies in the middle, and do C until 1 is back at position 4. Rotate R to bring piece 2 to the top position, and then do L'. You now have pieces 1 and 2 in positions 3 and 4. Piece 3 is solved in much the same way as piece 2: If piece 3 does not lie in the right loop, then do L' until it lies in the middle, and do C until 1 and 2 are back at positions 3 and 4. Rotate R to bring piece 3 to the top position, and then do L'. You now have pieces 1, 2 and 3 in positions 2, 3 and 4. Piece 4 is solved in much the same way as pieces 2 and 3: If piece 4 does not lie in the right loop, then do L' until it lies in the middle, and do C until 1-3 are back at positions 2-4. Rotate R to bring piece 4 to the top position, and then do L'. You now have pieces 1 to 4 in their correct positions. Rotate R to put as many of the remaining pieces in position as possible. If the middle piece is not white, then find out where it should be and consider the piece in that position. Otherwise consider any incorrectly placed piece. Do C or C' until that piece lies at position 7. Do sequence LCLRCRCRCLCR' to swap that piece with the middle one. Do C or C' until pieces 1 to 4 are back in position. Repeat b-e until the puzzle is solved. This solution method was devised by Bram Cohen. This method is easy to remember, as it has no long move sequences. Suppose that from the solved position you only do the moves LL and RR (and inverses L'L' and R'R'). The pieces will become mixed in pairs. The adjacent balls 1-2, 3-4, 5-blank, 6-7, and 8-9 will remain adjacent pairs throughout. Note also that a pair cannot be flipped over. The track is like a figure 8, and a pair has to be moved to the centre if it needs to go from one loop to the other. A pair may seem flipped over when it moves from the left to the right or vice versa, but as it has to go through the centre again to get it to its original position, a pair can never be flipped in place. Here we pair up the pieces, but make no special effort to flip them correctly. Note that apart from step a, we only do double moves LL or RR (and inverses) or the swap sequence LR'L'R. If you can, do some simple moves to build up some pairs already. Sometimes pieces that belong together are adjacent, but not in the right position to be considered a pair. For example, if piece 8 and 9 are in positions 2 and 3 then they do not form a pair, but a single L or L' move brings them to positions 1-2 or 3-4, and then they do become a pair. Use LL and RR to bring one incorrect pair into positions 3 and 4. Find the piece that should be paired up with the piece at position 3. Use LL and RR to bring the pair containing that piece to positions 6 and 7. If the piece at position 3 should be paired up with the piece at position 6, then do LR'L'R to make the swap. On the other hand if your pair at positions 6 and 7 is the wrong way around, then you can either go back to b and find incorrect pairs for which this does work, or use the method described in phase 2 to flip a pair. Repeat b-e until everything it paired up. Apart from the parity fix in step c1 we again only use double moves LL or RR (and inverses) or the swap sequence LR'L'R. Count how many pairs are flipped. Remember that a pair that is in the wrong half of the puzzle seems flipped but isn't. Count only those pairs that would be upside down if they were moved around to their correct spot. If there are no flipped pairs, go to phase 3. 1. do a single move such as R.
2. go back to step b of phase 1, and re-solve the pairs. Alternatively you could flip the centre pair by using the move sequence from the first method. Put one flipped pair in positions 1 and 2, and the other in the centre. 1. Do LR'L'R to flip the centre pair. 2. Do L'L' RR LL R'R' to put the other flipped pair in the centre. 3. Do LR'L'R again to flip the new centre pair. Repeat step e until there are no flipped pairs left. If there is one flipped pair left then you must have miscounted in step a. Phase 3: Arrange the pairs. Once more we mostly use double moves LL or RR. Put pair 1-2 in the left loop and pair 8-9 in the right loop. Put 1-2 and 8-9 in their correct positions. If the 5-blank is not in the correct position, then do LL R'R' L'L' R'R' once or twice until it is correct. 1. do LR'. This brings their pieces into the positions affected by the swap sequence. 2. Do the swap sequence LR'L'R. 3. Do RL' to put the pieces back, undoing the moves of step 1. RR L'L' RR L'L' RR: Reverses the order of the outer circle, e.g. changes from 1-9 to 9-1 and vice versa.